Sanderson 1/4 Plate hand & stand camera. Photograph gallery. In 1861 the Scottish theoretical physicist James Clerk Maxwell whose most celebrated work concerns magnetism, electricity and electromagnetic fields, created the first colour photograph. He achieved this by making three exposures of a tartan ribbon, each through a different coloured filter - red, blue and yellow. The resulting negatives were then made into positives, and all three were then projected through their respective filters onto a common screen. This additive process results in a colour image on the screen. As a homage to this event, I decided to have a go myself. I elected to use the common additive colours used today, known as RGB - or Red, Green and Blue. So I set up a suitable still life with only natural light from one side, a mirror to shine some light through the back of the glasses and made my three exposures. I compensated about three stops for the rather dark filters I found. 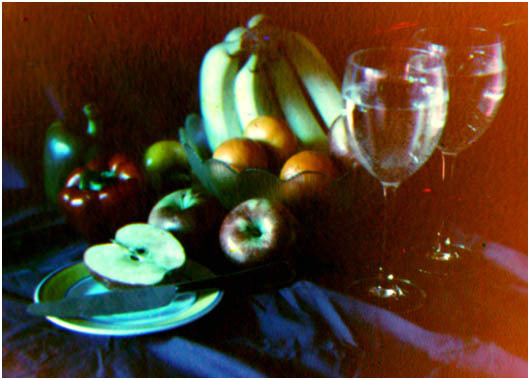 These were then processed in a suitably vintage tank, and the developer was left in too long deliberately, to punch up the contrast and was developed on the warm side. Just to really give it the aged look, the wash was freezing cold to really mess up the emulsion. As I don't have one projector that takes quarter plate, let alone three identical ones, the negatives were projected onto paper, photographed then combined on the computer to finish the process. 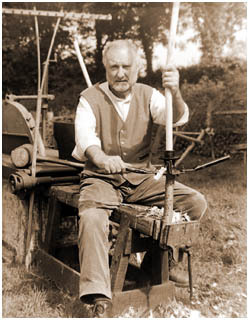 This picture was taken on the camera's first outing in May 2003 during a demonstration of traditional rake making at Manor Farm, Botley, in Hampshire. The film used was 20 year old Ilford FP4 cut film, and the resulting negative printed using the collection's 1910 Lancaster enlarger. The original negative is quite sharp, being exposed at 1/50th and f/11 and is quite contrasty too. However some of the plate carriers are a bit leaky and this was the only presentable result from the 6 exposure outing. This was so nearly an aborted trip, having got the Sanderson mounted on the tripod, level and the dark cover attached, the Bausch and Lombe shutter decided to jam. Fortunately a member of the public had a small knife with which I was able to use as a screwdriver to get the back plate off the shutter, sort it out and put it back together again. 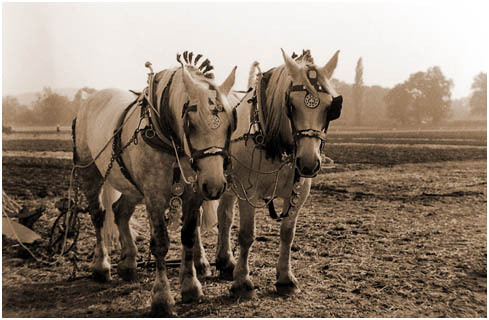 I decided to take a chance and shoot this one into sun, hoping that the hazy conditions would give a good period feel to these ploughing horses resting between cutting furrows. Using the dark slide as a lens shade prevented problems. 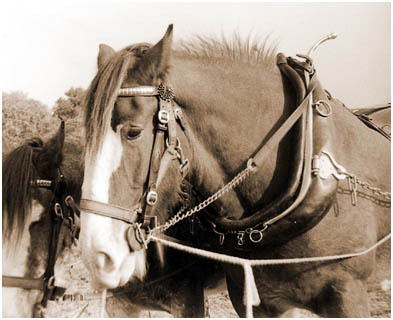 This was taken at Losely Manor, East Sussex at the National Ploughing Competition, in October 2006. Taken the same day as above, this was an attempt to get a shot off as fast as possible, it took about 2 minutes. Sighting and leveling the tripod takes the longest time, you can't hang around once the dark slide is in, just in case the beast moves. Technically this camera is a Hand or Stand Sanderson, that is it can be used hand held or on a tripod. I have yet to try it hand held, but will give this a go next outing. All negatives from this camera are processed in an ancient tin developing tank. Taken 17th December 2003, the 100th anniversary of the first successful powered sustained and controlled flight. 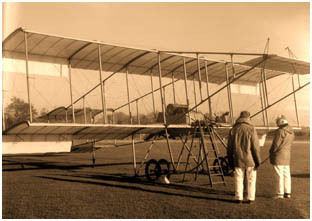 Various organizations and individuals celebrated the fact including The Shuttleworth Collection at Old Warden, who flew their replica of an 1910 Bristol Boxkite. Although a replica, this aeroplane is progressively becoming veteran in it's own right - as it was one of three built for the film "Those Magnificent Men in their Flying Machines" back in 1964.